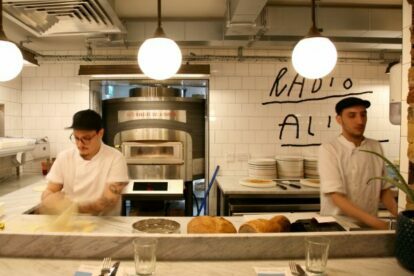 Radio Alice claims to do things differently, and there is something different about its delicious pizzas. They’re thicker than most, and yet implausibly light; the crusts are crisp on the outside and soft on the inside. A Bolognese recipe (as in the place, not the sauce) is said to be behind this, along with good-quality ingredients sourced from small-scale Italian suppliers and, finally, long-established baking techniques. So convinced is Radio Alice of its crusts’ virtues, in fact, that it even claims they’re nutritious. If you’re not so sure, the calorie-burning expanse of Clapham Common is only a short walk away. The toppings pull their weight, too; you can’t go wrong with the mozzarella, tomato and basil, in my opinion, but I haven’t been disappointed by any that I’ve tried. The chefs make a point of adding them at the optimal moment, and they’re all the tastier for it.